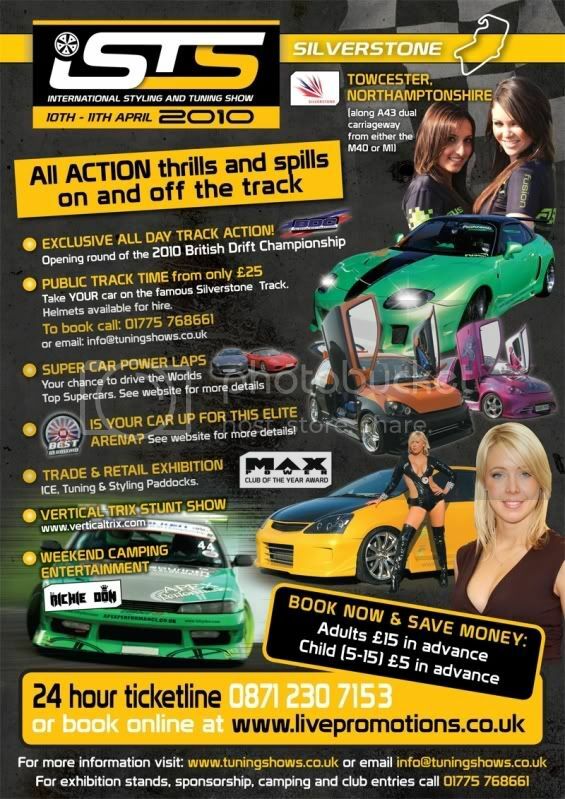 ISTS moves to its new home Silverstone for a weekend of action, thrills and spills on and off the track. All drivers and passenger tickets are £45.00 including camping and evening entertainment. But be quick - book by 31st January and tickets are only £40.00 each. Club booking bonus - for every 10 cars that book you get one drivers weekend ticket free! The Autoglym Best in Britain trophy is up for grabs again. Do you have the best car in the country? For more details contact info@auto-media.co.uk. Beat Button to the new F1 track with track time from £25.00 – to book your track time email info@tuningshows.co.uk or call 01775 768661 ext 224. Don't miss our ROAD TRIP PASSPORT when we head to Knockhill on 22nd August 2010 for the Scottish Tuning Show, book your place for both events at the same time and save £5.00 off the STS ticket price. A drivers ticket will be an amazing £5 and PASSPORT passengers just £10.